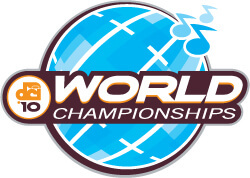 The following order of appearance for the 2010 Drum Corps International World Championship World Class Finals was determined by the scores earned by each corps at the World Class Semifinals on Friday, Aug. 13 in Indianapolis. Twelve World Class corps will compete in the World Championship Finals event for their chance to be called champions this Saturday, Aug. 8 at Lucas Oil Stadium in Indianapolis. All times Eastern time zone, approximate and subject to change. Gates open to marketplace—3 p.m.
Gates open to seating areas—4 p.m.
U.S. Marine Drum and Bugle Corps—5:28 p.m.
Volunteer of the Year Awards—5:55 p.m.
World Class Director of the Year Award—6:00 p.m.
Open Class Champion Exhibition—6:06 p.m.